Retail $4.09 SAVE 20% ! I love this paint. Olive drab is my favorite color anyway, but the Model Masters paint is good stuff. It applies well and distributes well with the brush strokes. I enjoy painting with the OD, and will buy more as needed. The only downside, but not enough to remove a star for, is the drying time. I am used to Games Workshop paints that dry really fast, but these are still great paints by Testors. One 1/2 oz (14.7mL) jar of Enamel Olive Drab Paint. 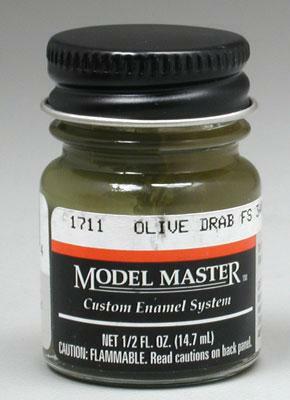 "Model Master Olive Drab 34087 1/2 oz"
Model Master paint always paints as said, it does very well when it stored over long periods. Is a little thick, but matches the spray color nicely for good touch ups. All military model camouflage have a shade of green. In this case, Model Master Olive Drab is a great match for FS34087 and in my case for a WWII B-26 Marauder. Very good coverage and no issues when ran through an airbrush.